Oh man, the 1970s and 1980s had the BEST educational kids' shows. "Electric Company"! "3-2-1 Contact"! "ZOOM"! And also, "Big Blue Marble"! Did you watch it? Did you ever get a pen-pal from there? I wish this show was rerunning today--I think it'd be fascinating to watch after soooo many years. No show had the international flavor this one did. This makes me wonder...I always remember a scene from a kid's TV show I saw when I was little. I used to think it was "ZOOM" but now I wonder. Anyway, it was a filmed bit (not scripted) about two girls who were best friends -- in England I thought -- and they had this whole fantasy world based around their hoppity hops, or hippity hops, or hobby horses. Some kind of fake horse thing that they bounced around on or rode around on. I saw that segment once and found it just fascinating, and of course would love to see it again. Does anyone know what I'm talking about, or did I perhaps dream this? I remember the show but I don't remember this theme song. It seems like I remember the theme ending with the lyrics "Big Blue Marble... in Spaaaaaaaaaaace!". Anyone else? 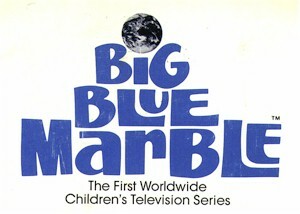 I loved Big Blue Marble. My sister & anxiously waited to watch every week! Oh man I loved this show. The mini-film they did about the haunted house was great. The whole show was awesome. Big ups to the 321 Contact as well and I seem to recall an excellent show about a community rec center called Powerhouse that was also awesome.